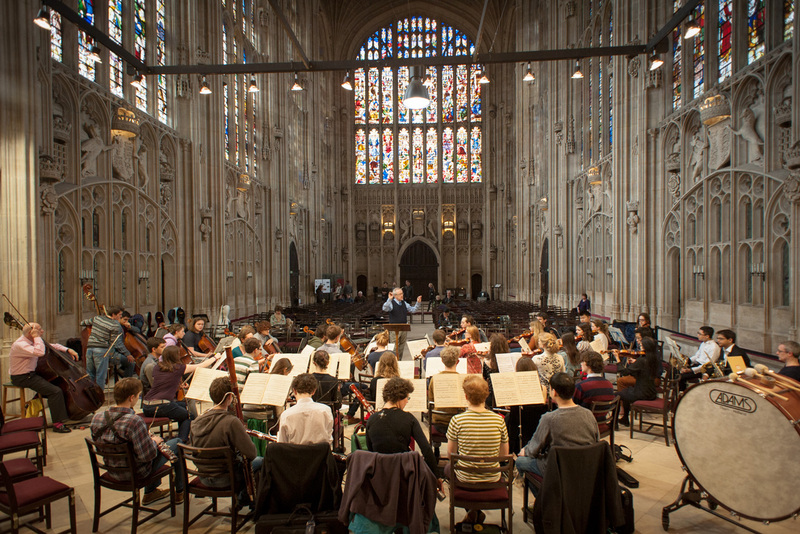 The Cambridge University Orchestra was rehearsing in the King’s College Chapel. A perfect location for a photo shoot. For this shot I used my 20 mm lens to fit the entire orchestra, and to show the beautiful place where they were playing. 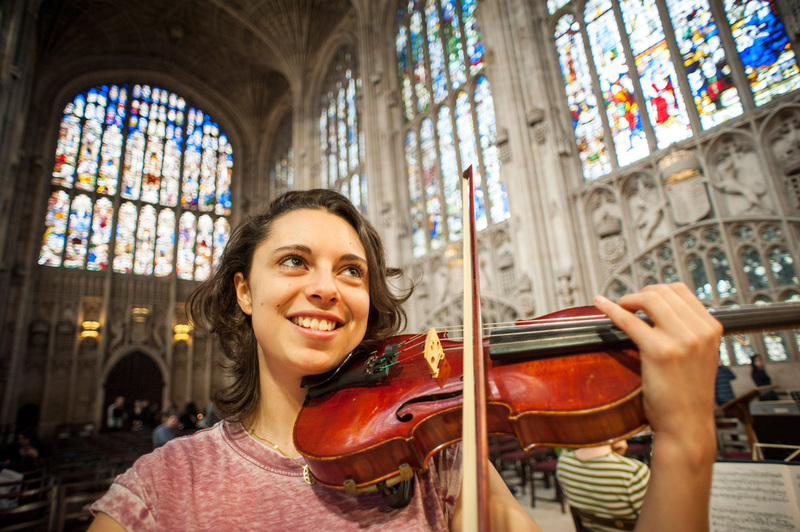 On Friday afternoon I got a message from Gabrielle Teychenne asking if I wanted to come along to photograph their rehearsal in King’s College Chapel. They had an evening session planned the same day, and then another session starting the day after at 10 o’clock. I double checked BBC’s weather page to confirm that by seven in the evening the sun would have set, so suggested I’d come along for the morning session. The reason was that I wanted the light to come through the stained glass windows of King’s, providing a beautiful backdrop to the concert photos. Most times I only bring one or two lenses along, but here I decided to bring all of them. The 50 mm lens is always on my camera by default. 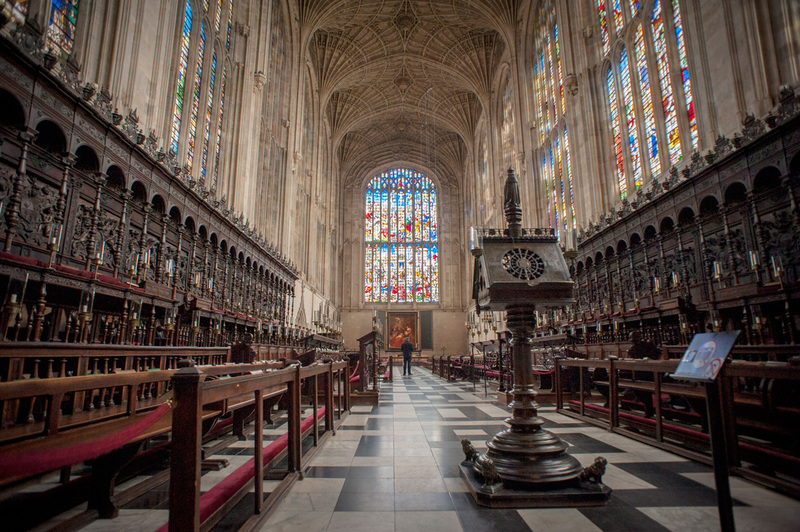 The 20 mm lens would allow me to get more of King’s College Chapel, but past experience has taught me that I have to be careful with putting people towards the edges. That lens has some serious reality-distortion issues. Lastly I packed my 85 mm portrait lens, since Gabrielle and I had talked about doing some kind of musician portrait shoot earlier, but we didn’t get around to do it then. When I started photographing as a teenager I had started with auto-focus because I found that it was tricky to get the manual focus exactly where I wanted it. I was doing the press-down-halfway-and-recompose, that allowed me to focus on the subject, then lock the focus so I could compose the photo the way I wanted. For every photo you take you have to redo the process which means you might miss something that happens suddenly. A month ago or so I saw a video about the benefits of decoupling shutter release and autofocus. This means one additional button press to take the photo, but it allows you more control of the process. For example, I can make sure my subject is in focus by hitting the AF-ON, then compose the photo. After that I can take as many shots as I want without having to refocus. Another benefit is that if you do the manual override on the focus which some lenses allow for, then that new setting stays until you press the AF-ON button again. On the back of my D700 there is an AF-ON button. In the menu I set a1 AF-C priority selection and a2 AF-S priority selection to Release, normally the camera will wait until it locks focus before it takes the photo, this change instead makes it take the photo right away. Then I set a5 AF activation to AF-ON only, otherwise pressing the shutter would cause the lens to refocus. Lastly the recommendation is to change your camera from single shot focusing to continuous focusing. The benefit of having it set to continuous focusing is that if you have a moving target then you can just hold down AF-ON and it will track it. This would be handy for things like running people, something I was not really expecting during the concert practice. One thing to keep in mind is that on my D700 the focus assist light only works if you have single focus, and not continuous focus, selected (found that out after a few months the hard way). Some cameras do not have a dedicated AF-ON button, but they usually come with one button which you can program yourself. It might require a bit of menu searching, but give it a try, it might change the way you handle your camera. 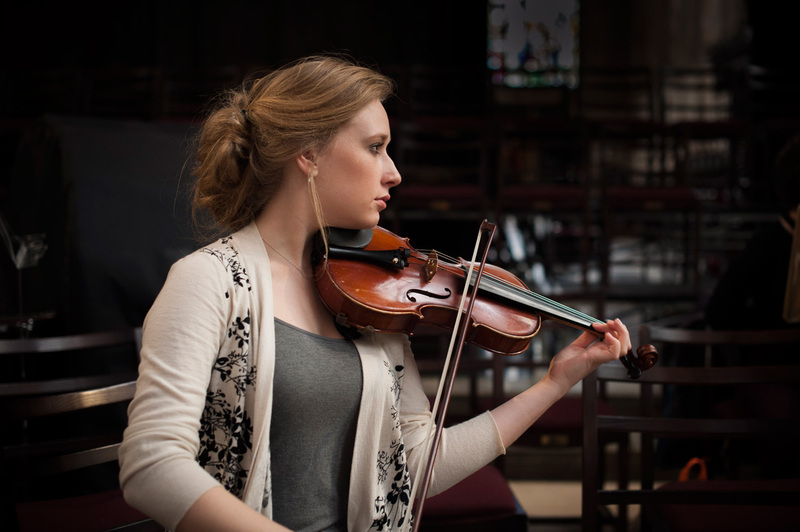 Grace Catherine Greiner, the photo was taken just before the rehearsal when I was still able to freely walk among the orchestra. I arrived about 15 minutes early, and used the time to walk around among the early arrivers in the orchestra to get to know some of them, and also to have a chance at some closeups. Here I find that it really helps to show the musicians the photos I have taken pretty quickly. When they see some of the results they are much more eager to participate, also the people around hear their response, so things just go a lot more smoothly. Of course there are one or two people who don’t want their picture taken, and that is fine. A few others are just a bit camera shy or self-conscious but given a little bit of time they tend to warm up. The Chapel was still open during the practice session, and as the morning progressed, more and more onlookers gathered. Given that it was open, they had to make sure that people could still get to the back-half of the Chapel. This allowed me some extra freedom in my choice of viewpoints. I could shoot from the side, and even move around behind the orchestra by taking the long route through the passage on the north side of the building. 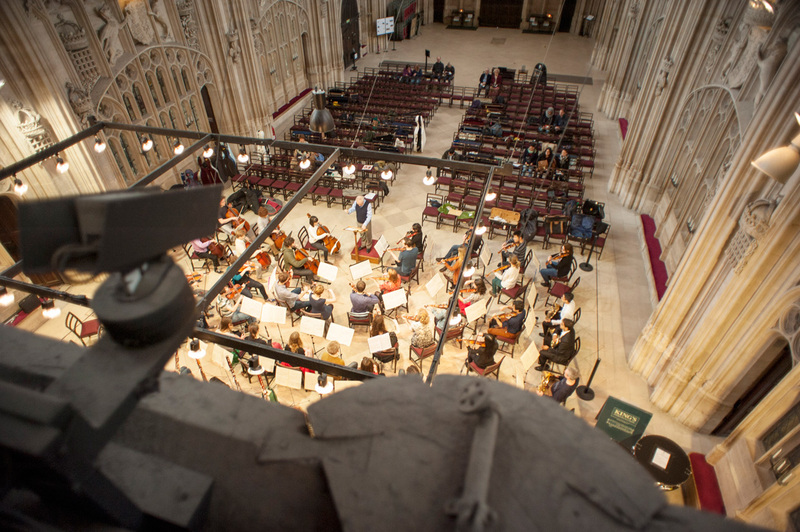 Switching to the 20 mm lens while standing behind the orchestra gave me a great view of the chapel, emphasising the beautiful location they were playing in. I also moved around a bit in front of the orchestra with my 85 mm lens, trying to get some close-ups, capturing some of the reactions and emotions. I ended up with a lot of photos of very concentrated musicians. 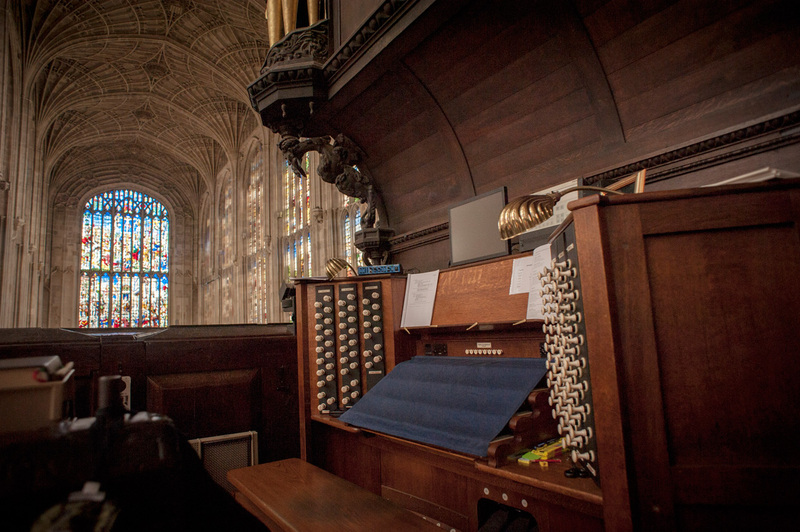 The organ in King’s College Chapel. The foreground was dark and the windows in the background very bright, so I underexposed the shot and then pushed the shadows. On the wall just behind me was the chorus prayer (see below). I like to see new places so I asked one of the King’s people if it was possible to get to a higher vantage point. She went away for a bit but told me she would be back. After about ten minutes she came back with an old little key and showed me the hidden passage up to the organ in the middle section. This felt like a secret hideaway where only a few selected organists ever ventured. There were some other hidden treasures to photograph up there. Someone had written a poem and stuck the paper up on the side of the wall. And there is no support in us. sing together in perfect harmony. It provided a nice view of the altar, but unfortunately the wall facing the orchestra was too high. So I had to heave myself up and sit on a dusty ledge to get a good shot. Looking at the photos after I probably should have tried the 85 mm from up there also, but it was a bit dusty and I did not want to risk getting dirt on my sensor, there is already a distracting smudge which you can see when photographing a clear blue sky. Anyway, getting a bit sidetracked talking about my sensor’s dust level. During the first break I got a chance to try out a few portrait photos with Gabrielle. I tried all my lenses, but must admit that my favourite one to use on this occasion was the 20 mm wide angle lens. Stepping in really closely I managed to get both Gabrielle without too much distortion, and the chapel around her in the background. It really gave a sense of being there. The 50 mm and 85 mm photos turned out ok also, but they were lacking some of the presence. Gabrielle Teychenne playing the violin during the first break. Against most conventions I went for the wide angle here, which I think turned out alright. I asked her to look up at the chapel ceiling, to make her part of the surroundings. You can see the King’s College Chapel’s altar at the far end, this place is huge. It took about 100 years to construct. Standing there while the orchestra was rehearsing on the other side of the divider just gave it a magical feeling. I live in Richmond, Virginia. I love this article & the pictures, too. Especially the picture of the organ. I love organs, I have played in church on special occasions (as a volunteer) since 1988. For about a month I have attended All Saints Episcopal Church (prior to that I attended Saint Bartholomew’s Episcopal Church). I like All Saints much better, they have an “English” choir (a men & boys choir that reminds me of King’s College). And their organ is one of the best, sound-wise. Again, I love this blog. It is resplendent.